igorous and alert, this powerful and agile breed is a native of France. A working animal, the breed?۪s most common job has been herding, but their acute sense of hearing also makes them an excellent watchdog. The Briard?۪s long, luxurious coat can be any solid color except white; they are usually black, gray or tawny. 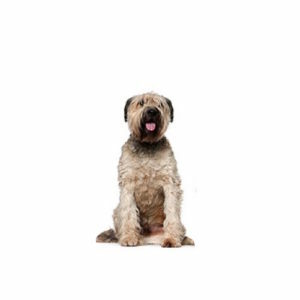 Centuries old and beloved by the French since the Middle Ages, the Briard has been depicted in 8th-century tapestries and mentioned in records of the 12th century. In early times, Briards were used to defend their charges against wolves and poachers. After the French Revolution, the Briard?۪s work gradually transformed into the more peaceful tasks of herding the flocks and guarding their masters' property. In America, the Briard?۪s history is not well documented ??? some credit the Marquis de Lafayette with the introducing the breed, but Thomas Jefferson also brought representatives of the breed to this continent. The Briard is happiest leading a busy, active life. This breed is an independent thinker, so patience is necessary when training. Like many sheepdogs, this breed may be wary of strangers. However, the Briard is very sensitive to his family?۪s feelings and makes an excellent pet if time and effort is put in to raising him. Grooming wise, the breed?۪s coat needs brushing every day to prevent mats. Herding Group; AKC recognized in 1928. Ranging in size from 22 to 27 inches tall at the shoulder. Are you interested in purchasing a Briard?